Each year, billions of dollars in energy are lost in the form of low-grade waste heat, a common byproduct of fuel consumption. Despite annual waste heat equating to 12 years of electricity consumption in the EU, there remains no commercial solution to convert that heat into usable electricity. But what if hot water, a resource that has proven nearly impossible to capitalize on, could be converted into a viable fuel source, thereby harnessing massive amounts of wasted heat energy and reducing global carbon emissions in the process? 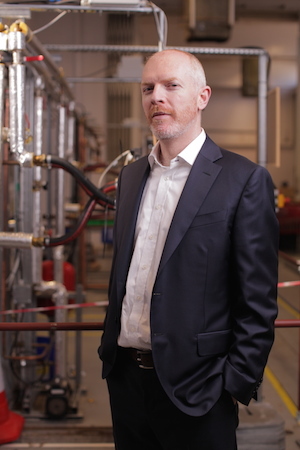 Thanks to Dublin-based Exergyn, one of the truly palpitation-worthy startups to emerge from Ireland/the U.K. in the last five years, the world may soon have access to an engine that runs on nothing but hot water. The Exergyn Drive™ creates electric or mechanical power from low-grade waste heat by tapping into an under-utilized material called shape-memory alloy, a super elastic metal that expands and contracts when heated and cooled. If the Exergyn Drive™ were to be fully deployed within its target market, it could reduce global carbon emissions by a staggering 1.2 percent, equivalent to the U.K.’s total carbon emissions in 2014. 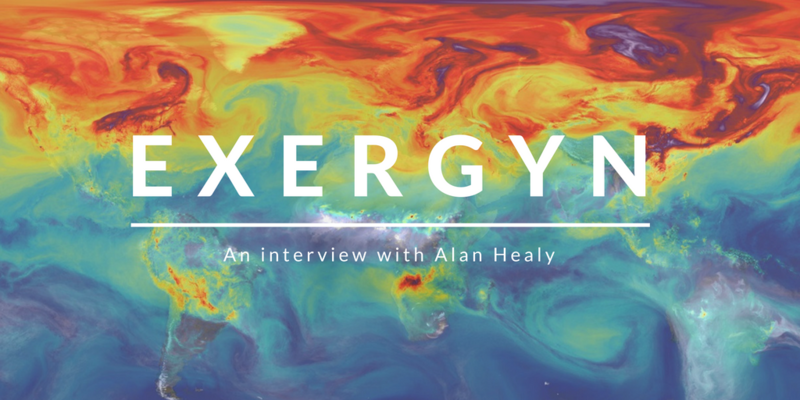 Co-founder and CEO Alan Healy sat down with Unreasonable on a rainy afternoon in the English countryside to discuss climate change, Exergyn’s potential for colossal disruption, and what it means to live unencumbered by fear. So let’s begin with the evolution of the company — what path have you traveled to arrive where you are today? So we got to work. I was the first full-time employee, unpaid of course, back in 2012. My partners were working for nothing too, though they sensibly kept working in other paid jobs part-time. Since then, we’ve raised €6 million in total between co-funding, fundraising, and winning a Horizon 2020 grant, worth €2.5 million. Now there are almost 20 people working with us. We have, we believe, solved the key issues around the technology. We’ve filed about 20 patents, so we feel we’ve locked down the tech such that no one else can copy what it is we’ll do. We’ve mapped a lot of the potential market and talked to a lot of customers. We’re producing ever-bigger, ever more efficient prototypes. We have produced grid-quality electricity which has been verified by a third party, who was the ex-President of the Institution of Diesel and Gas Turbine Engineers in the U.K.
Our next generation prototype, early 2017, won’t be too far from the end product. Just that we have to put 3,000 hours on it, so it’ll be somewhat funding related. But, yeah, we’re seeing some exciting times! What will it take to get you from this stage to commercialization? A: We’re constantly improving the technology. The wire that we use, the shape-memory alloy, contracts and expands, and just like an elastic band that you keep pulling and stretching, it eventually stops returning to its original shape. We’re learning how many cycles we can get from it, because when it wears out it has to be replaced, which will indicate the degree of maintenance necessary for the engine. Until a year ago, no one in the world had ever reached more than a million cycles with shape-memory alloy, so it seemed like we were sort of trying to push the envelope of what was possible. To date, we have tested a wire that reached over 3 million cycles. We project we can get to 5 million this year and 10 million next year. Ten million cycles within our product would represent a replacement interval of 2.5 years. What are some of the other current applications for shape-memory alloy? A: It’s used in some medical products. It comes in contact with the body and then contracts a little bit, so it’s used in hard stents, and in some braces. I think NASA used it on the Mars Rover. It’s typically been used for kind of high-end, somewhat expensive applications, so the way we’re using it would be very different and would require volumes of much more, much less expensive versions of the wire. And how does shape-memory alloy unlock this whole process? A: Shape-memory alloy is essentially one of the only substances in the universe that contracts — and does so powerfully — when heated; most things expand. So imagine I had a thin single shape-memory alloy wire, which is just nickel and titanium. One meter of that wire, when heated, would lift four of me up off the ground by three or four centimeters. It’s powerful. And if we have a relatively small core, we might fit 500 wires into that. Every 10 seconds we cycle hot and cool water in, so it expands, contracts, expands, contracts. And each core would lift the equivalent of 60 tons in that 10 second cycle. So we’ve got four cores working at a sequence of almost 250 tons every 10 seconds being moved up and down. 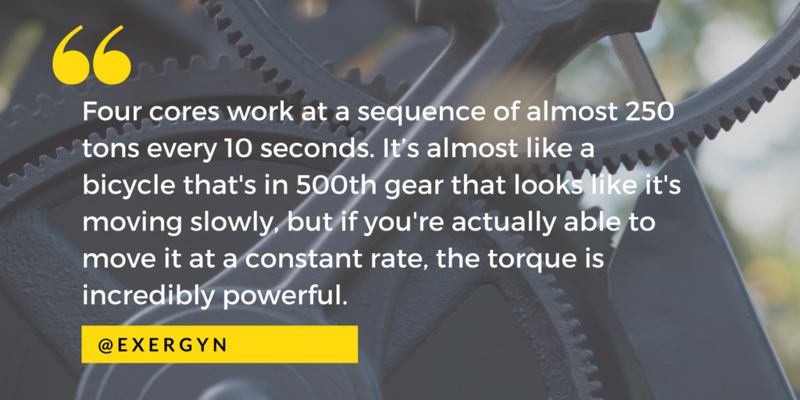 It’s almost like a bicycle that’s in 500th gear that looks like it’s moving slowly, but if you’re actually able to move it at a kind of constant rate, the torque is incredibly powerful. One of the greatest appeals of the Exergyn engine is that it could be produced so cheaply. Most of the other materials already exist on the market, right? A: Yep. Hydraulics and electrics have been around for over 100 years, so it’s very old technology to take a vertical movement up and down and convert that into electricity. We can buy the hydraulics and the electrics off the shelf, and even our own unit you can buy — the pistons, the valves, the steel that goes around the core — all off the shelf. In terms of what materials we’ll need to have manufactured, it’s really only the shape-memory alloy itself. It’s that simple, really, that’s all it is. What are some of the challenges you face as CEO of Exergyn? A: Well, we’ve been going for about four years now and we’re looking to commercialize in a couple of years. We’re hoping to raise about €8 million in the next six months or so, and that’s probably the big challenge. But another challenge is actually when you’re running around with a million things to do and there’s the fog of everyday life and you need to see how you can identify the right problems that need to be addressed and how to break those into components that can be dealt with. 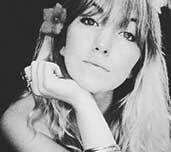 I think personally as well, I often feel a little bit between two worlds as someone who can be quite creative, and someone capable of being very organized and corporate. So corporate people think I’m a bit artsy, artsy people think I’m a bit corporate, and a lot of other people just think I’ve made a lot of mad decisions over my life because I’ve never really been afraid in the same way that some people seem to be. 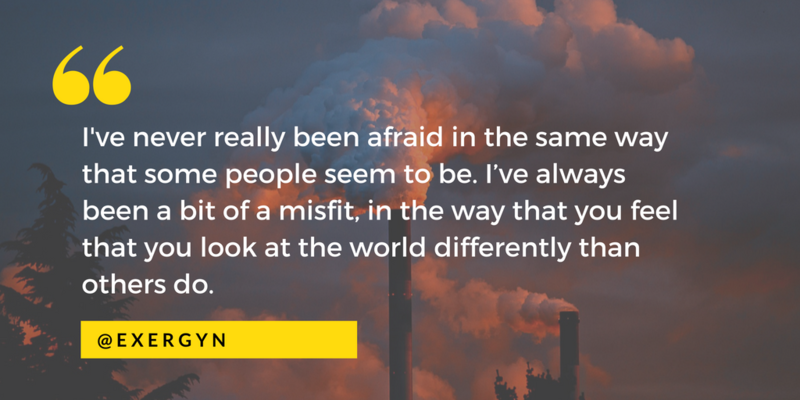 I suppose, like many in the spirit of Unreasonable Group, I’ve always been a bit of a misfit, in the way that you feel that you look at the world differently than other people do. Tell me a bit more about how lacking fear has enabled you to pursue the work that you’re doing now, and what your relationship to fear is. A: Well, I guess I’ve been quite a philosophical person from an early age, and very early on I reckoned that I’m incredibly lucky to be born in the age I’ve been born. I’m also very lucky to have been born in the “first world” and to have been born into a family where I was given access to education. 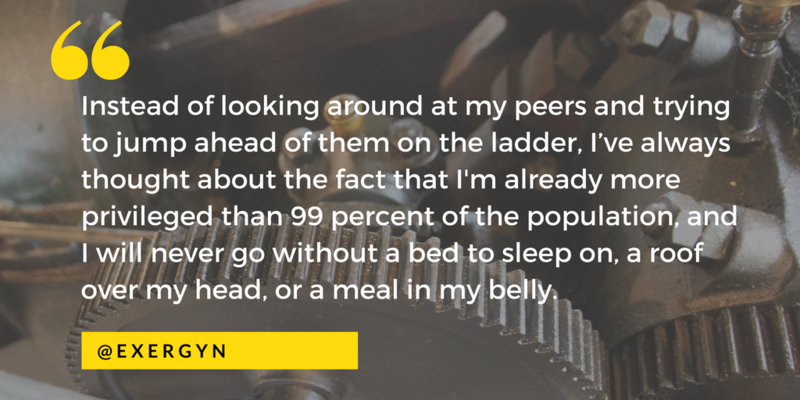 So instead of looking around at my peers and trying to jump ahead of them on the ladder, I’ve always thought about the fact that I’m already more privileged than 99 percent of the population and, so long as I can stay healthy, I will never go without a bed to sleep on, a roof over my head, or a meal in my belly. I’ve never seen the need for the expensive car. I guess I always knew that money didn’t really make me happy, even when I worked for Goldman-Sachs for a couple years — at the start of my career, when the money was relatively normal compared to my peers, but likely to leap stratospherically if I stayed. There’s nothing that I’m afraid of, really other than ill health to myself and my family. So if you start off from that point of view, you can’t really be afraid of failing. I’m not afraid of how people view me. Most of my peers thought I was absolutely bonkers when I left Goldman-Sachs to head down to South Africa to set up a brick factory in a township. But Mandela had come to power and I thought that was a good thing to be doing. Up until the age of 40, instead of chasing the dollar, I was seeking adventure and fulfillment. So as soon as I felt I’d mastered one area — whether that be finance or law or marketing — I’d look to another, just out of a sense adventure. Eventually, I began writing patents (just two) and children’s novels. 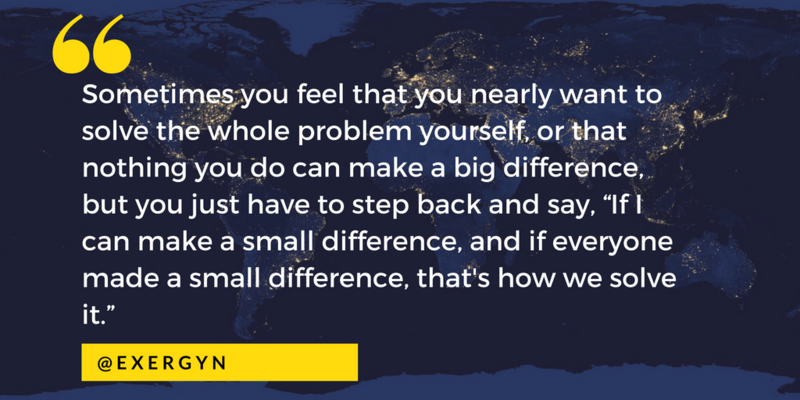 By the age of 40, I thought, “Well, maybe I could bring all those skills together and focus them on something.” I had been going into schools and talking about climate change because it was a theme in one of my books, and then when I had a daughter, I decided I had done enough talking about it. It was time to try and do something. To be honest, when you start out, it’s all about storytelling. Four or five years ago, all we were selling was a story. It was a vision. And so the ability to storytell, and to bring it together very cohesively into a business plan using the skills I had acquired, was what enabled the finance to come through — in multiple small funding rounds — and therefore to help allow the dream to become a reality. How has your relationship to your daughter and your legacy affected your desire to impact the massive umbrella of climate change through your work with Exergyn? A: Well, actually it was after 9/11. 9/11 was one of those things that just made me realize that it’s hard to plan anything in life. It made me really stand back from what I was working on. Climate change seemed like such an important issue, and it was wrapped up a little bit in the theme of the children’s book I was working on, called Tommy Storm. The story is set in a future when Earth’s been altered due to climate change and the whole planet is covered in water. There are floating cities everywhere, and they all bicker and can’t agree who’ll name which city after which country, so they compromise and name themselves after varieties of cheese. That’s the kind of tone of the book, there’s a lot of silliness, but you can’t hit kids over the head with something like climate change. I always felt it was dealt with in a very solemn way. You can tackle something with a little bit of humor, but humor only works when there’s a little bit of truth in it. How can Exergyn make a difference? A: The amount of wasted hot water out there is enormous. The total amount of energy lost each year as wasted hot water alone is equal to twice the output of Saudi Arabia’s oil and gas. So we’ve developed an engine that runs on hot water. And our addressable market is a big potential value, €290 billion, or so. And if we could deploy our product 100 percent, that could reduce global carbon emissions by over 1 percent annually. So, something like cargo shipping, for example. So much of everything we consume is still transported by ships. Almost everyone travels by plane, so we don’t think about it, but almost everything we get, everything we have, is shipped. There’s still a huge amount of wasted hot water there. Then there are solar applications where you could produce hot water very quickly, and with our unit you could even electrify African villages at low cost. Who will your initial target be? A: The world is changing so fast at the moment in our energy market. What we need initially is to target people who use their engines 24/7 and either pay a high price for electricity or get a high price for the electricity they export. So, we are initially thinking of biogas, possibly someone who provides electricity to the healthcare sector, because they need to guarantee 24/7 power. So we’ll need to be sure we’ve got the engine perfected on land before we go to sea. We’ve got a lot of moving targets and it will likely depend a lot on who the investors are, and where that wind directs us. I would imagine it takes a certain degree of courage to develop an engine that might render certain types of fuel obsolete. Are you anticipating any pushback? A: We actually think that our unit won’t see much pushback from anyone because, to some degree, we will make existing engines more efficient. We won’t make fuel obsolete. We will simply reduce the carbon intensity of what is there already. What do you hope the world would look like as a result of the success of Exergyn? A: We at Exergyn are not saying that we will solve the problem. You have to tackle it from many, many different directions. But we hope to be one element of that solution. The very fact of Exergyn being successful will mean that people are beginning to see that inefficiency is an issue and that you need to try and reduce that inefficiency, and that there’s a value in capturing waste heat. Exergyn’s role in itself would have a positive effect on the environment, but even moreso as more technologies are coming forth that enable cheaper solar and cheaper wind and cheaper everything else. I hope we will move ourselves collectively towards a more sustainable path. How would you define that sustainability? A: Well I suppose that’s a huge part of the question. If sustainable means that if we stick with just what we’re doing we can just about avert disaster, that’s terrifying, because you’ve got no buffer. I would hope that people would put a price on carbon. That’s probably the ultimate buffer. A carbon tax would also make our product and other technologies more viable, while making carbon fuels less attractive. If we could get tens of thousands of our units out there alongside other emerging technologies, we could start to eat into reducing the increase in carbon in the atmosphere. We only ever look to 2100 and talk about how we can stay below a 2 degree temperature increase. But even if we just keep the current amount of carbon in the atmosphere, what will the world look like in 2400? You never hear that conversation. 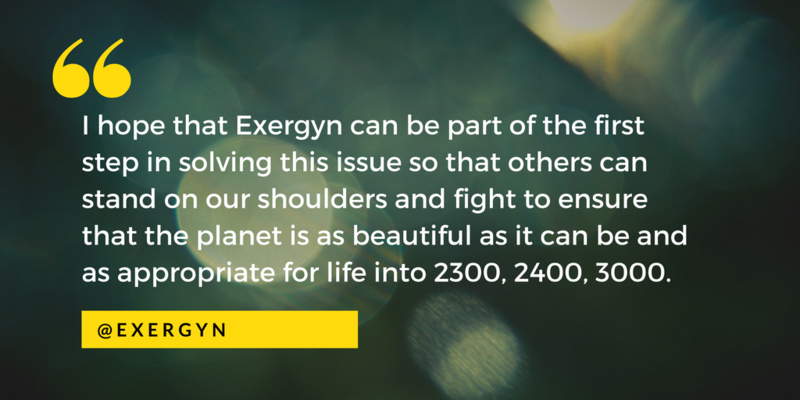 I hope that Exergyn can be part of the next crucial steps in solving this issue so that others can stand on our shoulders and fight to ensure that the planet is as beautiful as it can be and as appropriate for life into 2300, 2400, into 3000.